Welcome to Atom Land, a subatomic realm governed by the laws of particle physics. Here, electromagnetism is a highway system; the strong force, a railway; the weak force, an airline. 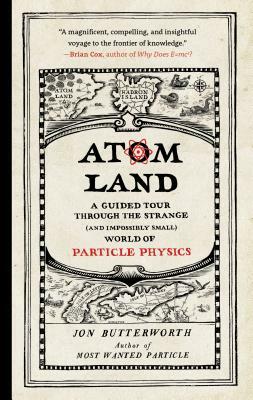 With award-winning physicist Jon Butterworth as your guide, you’ll set sail from Port Electron in search of strange new terrain—from the Isle of Quarks to the very edge of Antimatter. Journey into an unseen world—and to the frontiers of human knowledge. Jon Butterworth is a professor in the Department of Physics and Astronomy at University College London and a member of the ATLAS collaboration at CERN’s Large Hadron Collider in Geneva, Switzerland. He writes the Life and Physics blog for the Guardian, has written articles for a range of publications including the BBC and New Scientist, and is also the author of Most Wanted Particle, shortlisted for Book of the Year by Physics World. He was awarded the Chadwick Medal of the Institute of Physics in 2013 for his pioneering experimental and phenomenological work in high-energy particle physics. For the last fifteen years, he has divided his time between London and Geneva. “A magnificent, compelling, and insightful voyage to the frontier of knowledge from a great writer with a deep understanding.”—Brian Cox, author of Why Does E=mc2?